As a kid born in the 80s and growing up in the 90s, I was surrounded by 90s culture for much of my early life. Sitcoms were all the rage. RPGs from Earthbound to Final Fantasy VII launched. It was a key period in my life, and yet I remember it only as if it were a dream. I mean, let’s be real here; I’ve been gaming for as long as I can remember, and yet the first half of the 90s didn’t have a PlayStation in it. So what the hell was I doing during that time? (Honestly, probably playing SNES, but don’t tell anyone. I’m a PlayStation diehard!) It’s always funny to me when some 90s fad comes up again and brings me back. I may not remember that decade through vivid memories, but the sight of pogs, tamagotchis, and classic PlayStation titles somehow always drags me back (can anyone say “MediEvil?”). It’s been two years since I last went hands-on with YIIK: A Postmodern RPG, and much like my life in the 90s, absence and time slowly made it fade from memory. As soon as I saw it on the list for PSX 2017, I knew I had to give it a spin again. See, YIIK is an RPG that embraces the oddities of 90s culture and digitizes them into a wonderful RPG—period accurate, of course—to the RPGs of that decade. It is heavily inspired by games like Earthbound, and the text boxes are basically ripped right out of Final Fantasy VII, but the silly references from 20 years ago don’t stop there. The main character’s house is laid out like the set from Full House, and the logo for the town I was in couldn’t be more similar to Seinfeld if it tried. It just doesn’t get much more 90s than that. See that Final Fantasy-styled text box? It’s there, just under the girl with the bleeding eyes being sucked into the void of space. My demo this year wasn’t near as intensive as the one in 2015. It seemed to start more at the beginning of the game, so it was a slow build, weaker enemies, and didn’t really highlight some of the diversity the full game will offer that I saw last time. My journey took my from my home town where I set out to get groceries, to an abandoned factory where I chased a cat that looked like Salvador Dali. Inside of this warehouse was a bizarre realm. I definitely wasn’t in Kansas anymore. Some light puzzle solve and a number of battles later, I meet a really weird girl, but our time together is fleeting. On the elevator, she is pulled away into the darkness by mysterious forces, and I presume my journey will be trying to figure out what the hell just happened here. The dialog is all clever, witty, and sharp, and more than once I laughed out loud, chuckled, and snickered right there on the show floor. 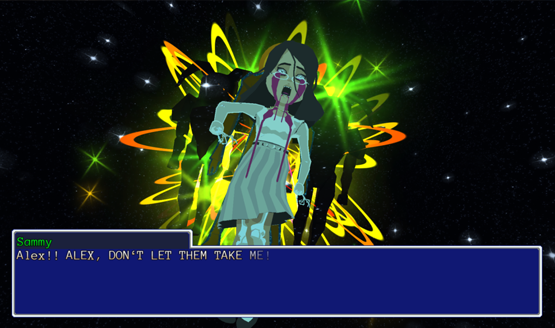 YIIK is amazingly reminiscent of the kind of strange charm that Earthbound had. I’ve been looking for a game like that for years, and haven’t found one that evoked those same feelings until now. It celebrates and embraces 90s culture, and I’m looking forward to seeing what other references they put in there that will bring me back to my childhood. Perhaps most importantly of all? YIIK brings back the overworld map, a long forgotten RPG feature that screams 90s at the top of its lungs (Yes, yes, I know. It’s been in games since then. I just miss it, okay?). I met a girl with a cat named Dali that looks like Salvador Dali, but is a girl cat and not named after Dali despite the mustache. 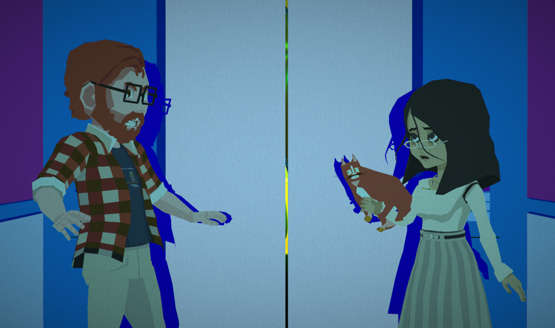 YIIK: A Postmodern RPG has been off the radar for far too long. It will finally be releasing in- wait? When will it be releasing? Their site still says early 2017 and I can’t find a confirmed new release date anywhere. Obviously we’re a little past those previous projections. Whenever it ends up releasing though, it will instantly transport gamers back 20 years and that’s an exciting prospect. Hopefully they can move the game from being just being demoed at shows to launch sometime next year and won’t play with my emotions in perpetuity.